Welcome to our gallery of beautiful cottage kitchen ideas. Cottage kitchen designs are known for being cozy, with a down to earth, care free style that’s inviting and attractive. The cottage style is inspired by kitchen designs from a simpler time with soft colors and emphasis on charm and functionality. 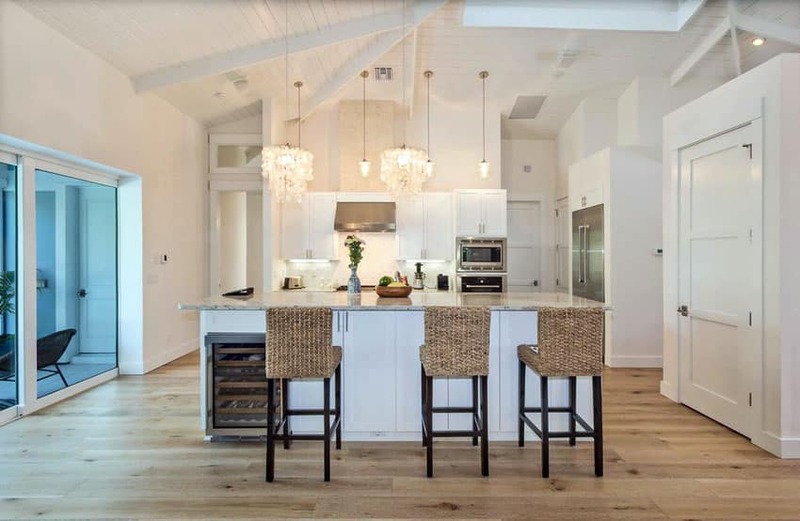 Below you’ll find a variety of cottage kitchens with cabinetry, flooring, lighting, fixtures, and appliances that represent this beautiful decorating style. This gorgeous modern kitchen takes inspiration from cottage style kitchens and incorporates some of its elements into the design. Hardwood floors set a warm base to the space, while the gray-painted cabinets offsets it with a cool tone. The overhead cabinets maximizes the full height of the walls for storage, resulting in large overhead cabinets. For the countertop, Calacatta marble was the choice of material which perfectly suits the apron-front ceramic sink. A unique element of this kitchen would be the use of antiqued mirror for its backsplash which gives it a touch of both modern and classic aesthetic. Cottage kitchens posses the timeless look of classic kitchens, but has a more casual and laid-back feel. It mostly seeks to achieve a light and airy feel to a space, and therefore uses mostly light colors to achieve a light and airy look. There are many typical elements found in a cottage kitchen (which does not necessarily have to all be present), as well as various color and material combinations you can go for. Muted color theme – A soft muted color theme is often used for cottage kitchen ideas to create a light inviting space. Color palettes are often made up of whites, pale yellows, pastels and light khaki. Its not uncommon to see a two tone color theme with the base cabinetry being one color and the kitchen island being another. Beadboard cabinets – One of the most telling elements of cottage style kitchens would be beadboard cabinets, which is basically a grooved style vertical paneling which helps add more dimension to the surface. 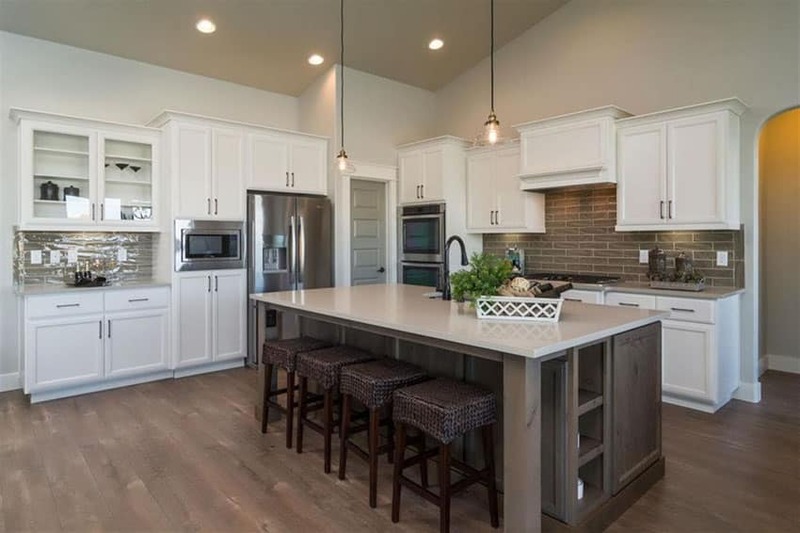 White painted cabinets – Aside from this, cabinets are often painted, typically in white, but other subdued colors are also acceptable, or a combination of both. To match the vintage look of the cabinets, vintage style pulls and hardware is also a must, as well as apron-front sinks and matching fixtures. Wood flooring – May it be hardwood, engineered or vinyl, also complete the cottage style look, and adds more warmth and a vintage appeal to the space. Farmhouse sink – A beautiful large basin farmhouse sink can bring just a touch of the country kitchen style into your home. Also known as apron front sinks, these large sinks offer plenty of space for cleaning up and have becoming more popular the last several years. 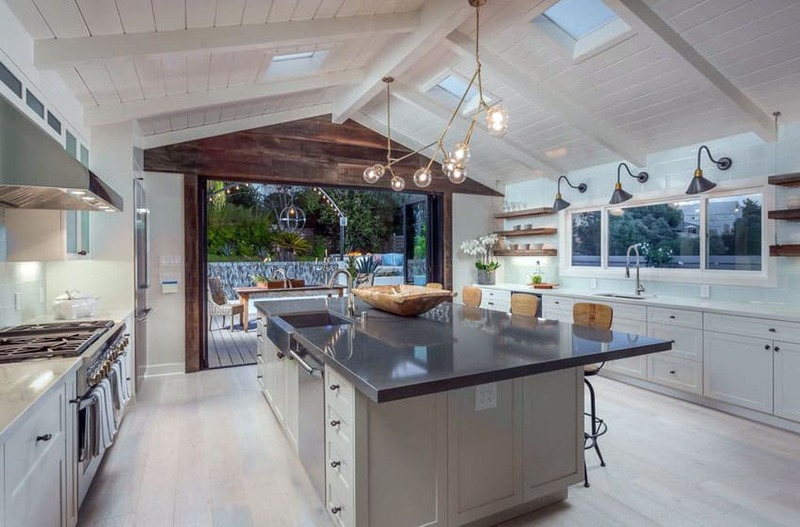 Vintage lighting – Light fixtures such as pendant lights with brushed nickel, an antique patina, or frosted glass can give your kitchen a vintage inspired feel. Many cottage kitchens use vintage style light fixtures to bring a touch of retro style to the room. This modular kitchen uses paneled cabinetry painted in a neutral gray tone, achieving a very rustic look when paired against the pale walnut flooring. 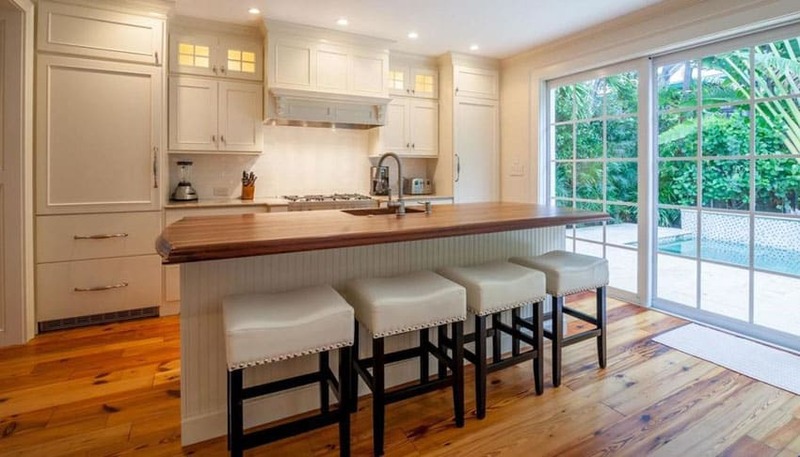 It has a kitchen island in the middle with beadboard base, functioning mostly as a dining area and additional preparation area. Pull handle hardware is often used for cottage kitchens and is used here to match the look of the round pendant lights and antique lamp. The rush seats of the bar stools used also helps emphasize the rustic feel of the space. Combining elements of modern kitchens with cottage style kitchens, this spaces achieves both the simple and sleek look of modern kitchens and the classic charm of cottage kitchens. 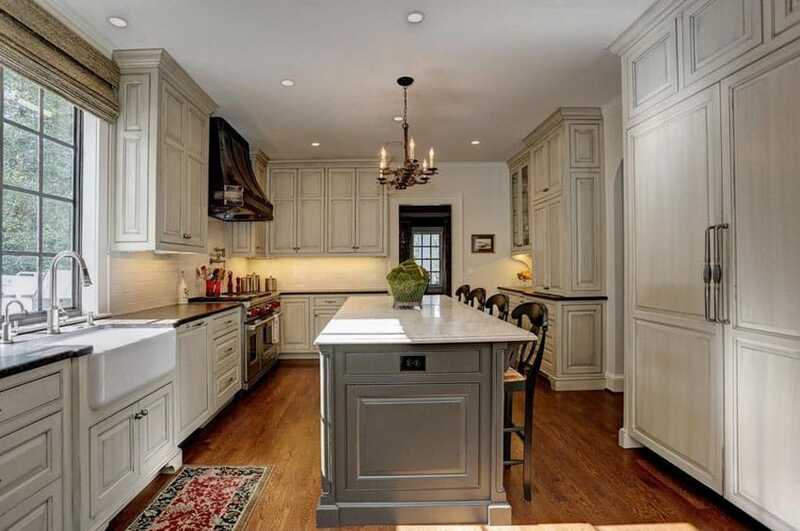 It uses white-painted cabinets with beadboard paneling, topped with white marble for a very classic feel. 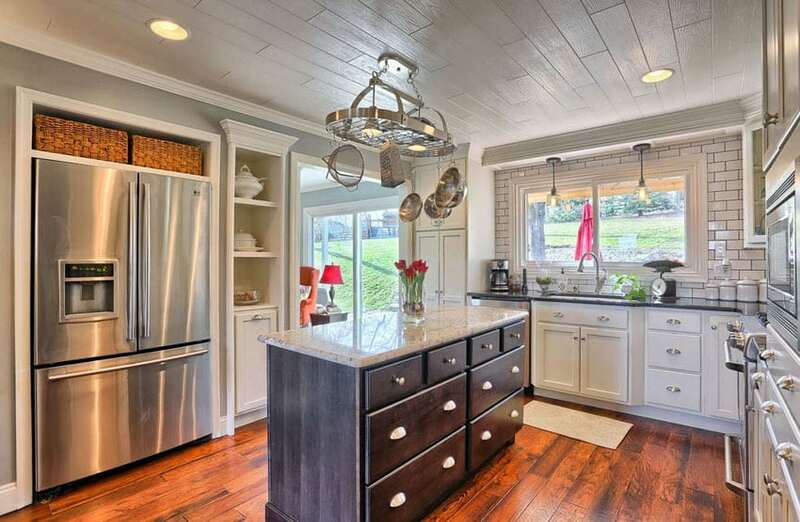 It also incorporates open shelving for the overhead in combination with closed cabinets. White subway tiles were used on the backsplash which nicely offsets the maple wood range hood cover and cantilever shelves. Going for a truly classic vintage look, you will see the cottage style not only reflected in the kitchen but in the architectural elements and finishes as well. Large French casement windows allow natural light to spill into the interiors, creating a gorgeous naturally-lit daytime ambiance. 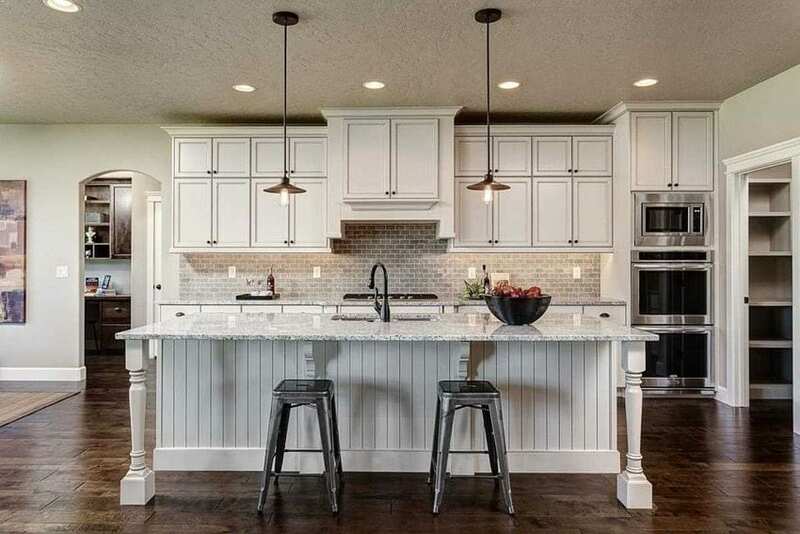 The pale khaki-painted cabinets has beadboard paneling complete with white marble countertop and an apron-front sunk to go with the vintage style of the cabinets. The horizontal wall paneling and the ceiling planks also helps complete the over-all cottage loo of the space and creates a fresh yet timeless kitchen space. 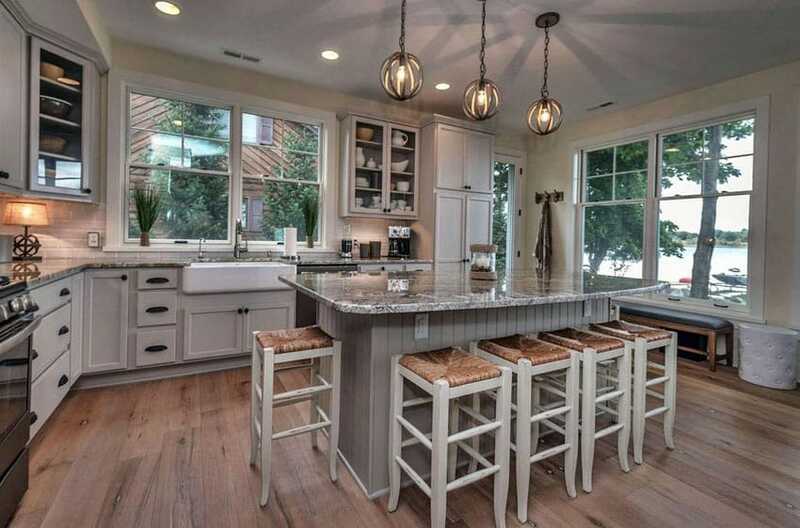 Gorgeous walnut flooring definitely stands out in this classic-inspired modern kitchen. 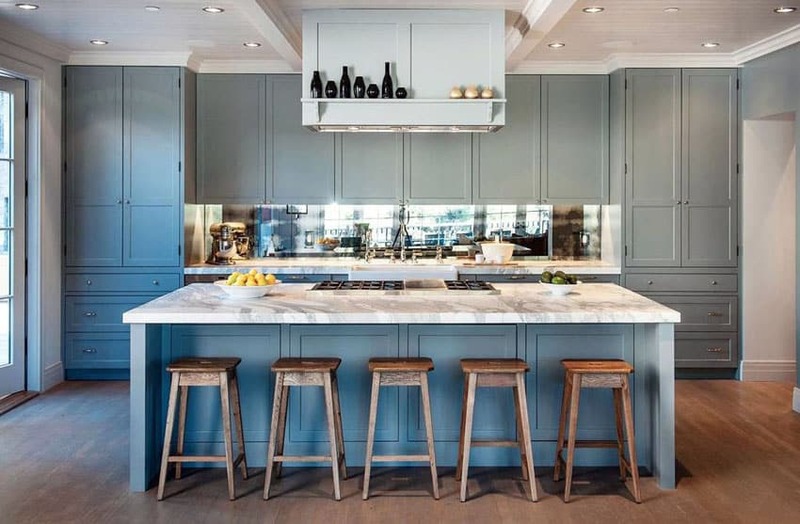 It uses simplified paneled kitchen cabinets painted in a very light sage green color which gives a nice contrast against the walnut floors and bar stools. White carrara marble used on the kitchen islands somehow creates a softer look to the surface, while the main kitchen counters uses black to contrast with the white marble subway backsplash tiles. Completing the while cottage style look are the 2 fabric pendant lamps hanging above the kitchen island which helps set a relaxing vibe to the space. This cottage-style kitchen are often seen used on modern interior style to add a bit of a vintage chic feel to the space. 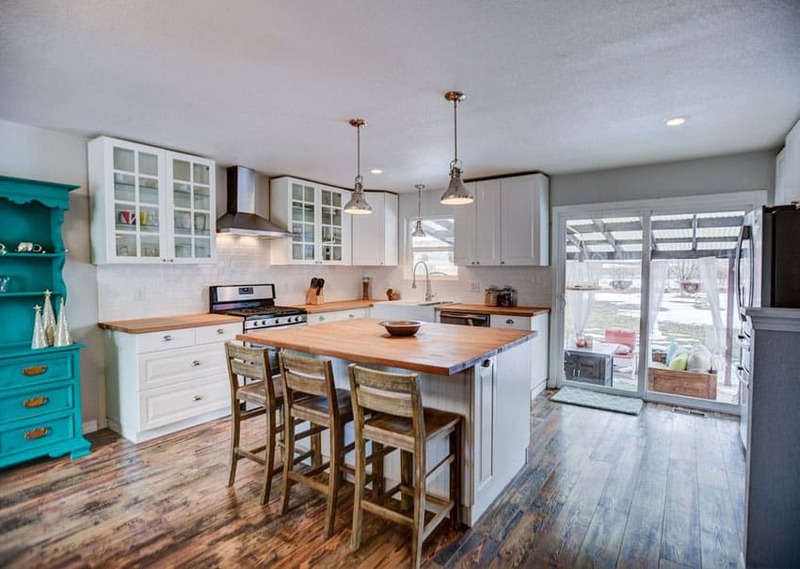 Reclaimed rustic fruitwood flooring set a rough and rugged feel to the space and contrasts with the clean white paint finish of the kitchen cabinets. While the main cabinets uses simple paneled faces, the front of the kitchen island has beadboard paneling on the front, complemented by rustic wooden barstools. 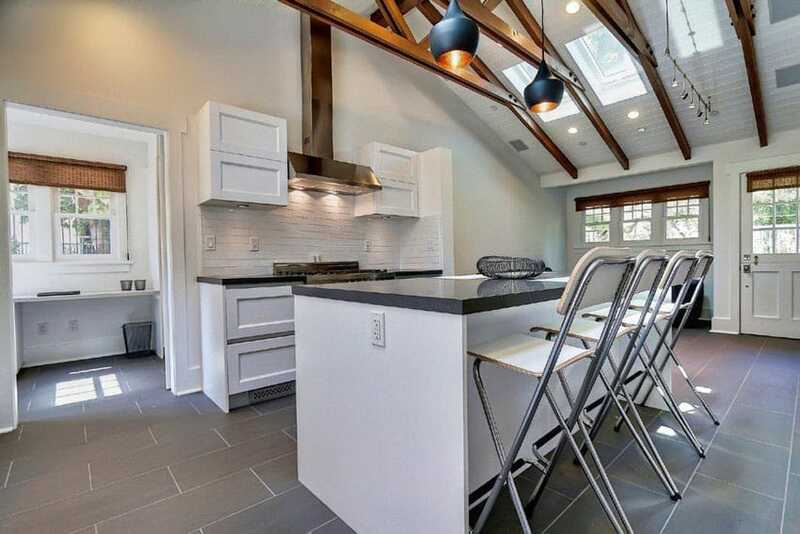 It also features glass-door overhead cabinets in combination with closed cabinets, solid Teak wood countertop, apron-front sink, white subway tiles for the backsplash and vintage-style pulls & lamps. Also noticeable would be the teal-painted free-standing display cabinet also common in cottage-style kitchens. The smaller space accorded to this cottage-style kitchen allowed it to simplify the style accordingly to match with the proportions of the space and create a balance which would not overwhelm. 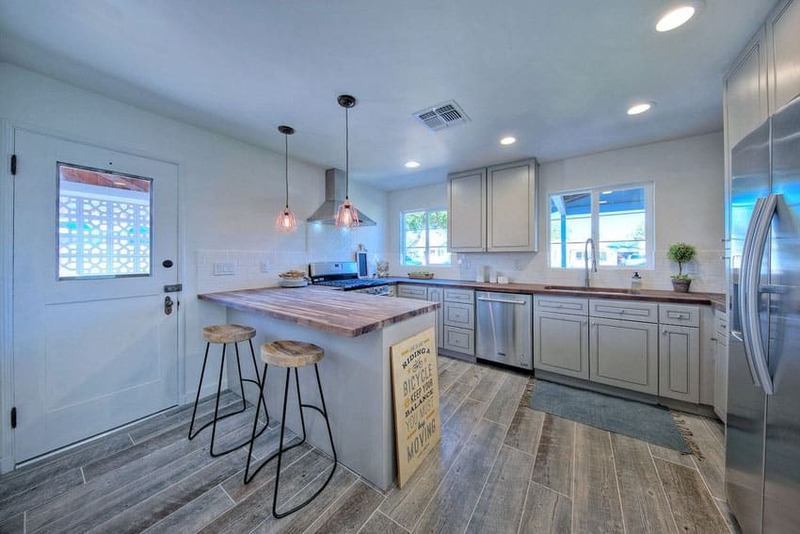 Solid teak wood flooring already create visual impact, therefore, the kitchen cabinets goes for a more subtle off-white color to match the doors and windows. Paneling style is simple as well, with on the front of the kitchen island using beadboard paneling. The Kitchen island uses solid wood countertop with a classic bullnose profile, while the main cabinet counters uses a simpler rood bullnose for its cream granite countertop. The built-in cabinets of this cottage-style kitchen seems to blend in with the walls of the space as they were built into the niche on the walls and are painted with the same light yellow color as the walls. It’s large kitchen island, on the other hand, was painted in a sage green color, adding a welcomed touch of cool color to the predominantly warm-toned space. 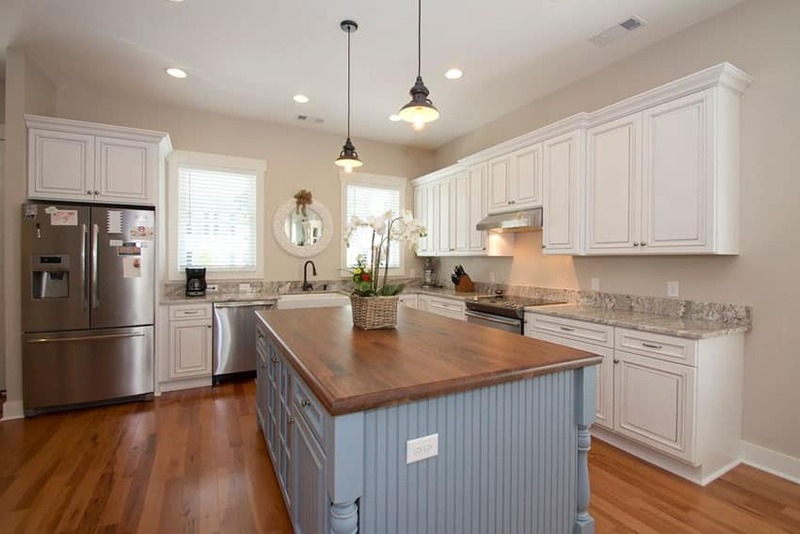 Cottage style kitchens usually use a paint color lighter than the wood flooring for the cabinets and furniture, but in this example, you will see the opposite. Since the flooring is teak wood, which is mid-toned, the kitchen cabinetry were painted in black, which achieves a very bold contrast against the main finishes. It uses a yellow-beige granite countertop, helping mimic the color of the teak wood flooring. This small kitchen was placed in the middle of the open space, giving it a very light and airy feel, especially since it has a high sloped ceiling. The cabinets are white and were placed against dark gray ceramic floor tiles, and topped with black granite for a nice contrast. 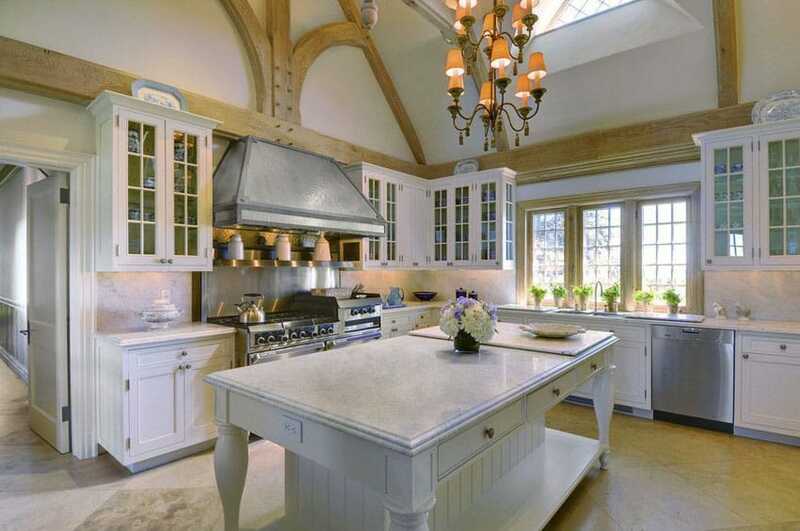 A gorgeous French cottage-style kitchen with elegant finishes and details. All cabinets are painted in white which definitely looks marvelous paired with the pale wood finish of the beams and trusses. 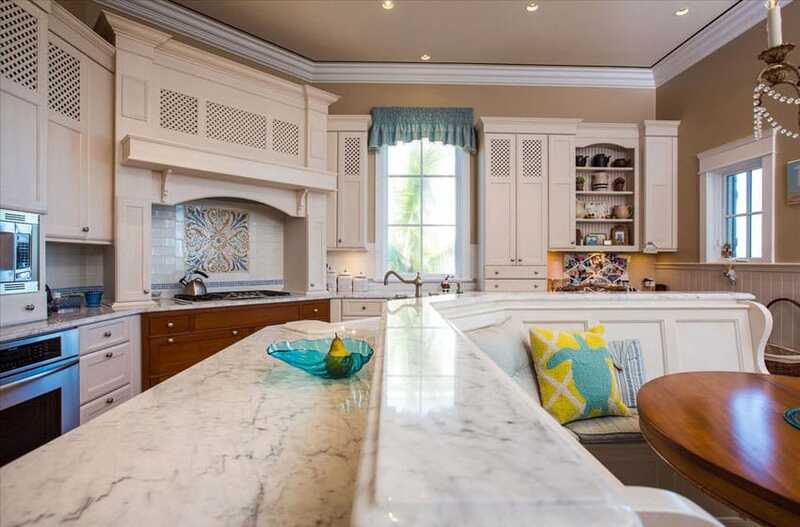 White marble with elegant bullnosing was used for a very accurate period-style depiction, while the overhead cabinets uses French-style doors, allowing you to display precious china pieces. Going for a softer, more romantic feel, the colors used in this cottage kitchen are in all white and combined with other light colored materials to maintain the soft look. All cabinets were painted white which look perfect against the light maple flooring. Light gray granite was the material of choice for the countertop, while the bar stools uses rattan seats left in its natural color to match the flooring color. Also completing the ambiance of the space are the crystal lamps and the large skylight. Although this cottage style kitchen uses white wood flooring instead of the usual wood finish, you will still see dark wood finish on the door frames to keep a more subtle contrast. Due to the less wooden elements in this space, this design has a cooler tone common in modern kitchen designs. White-painted cabinets are topped with cool gray solid surface and white solid surface for a seamless surface. 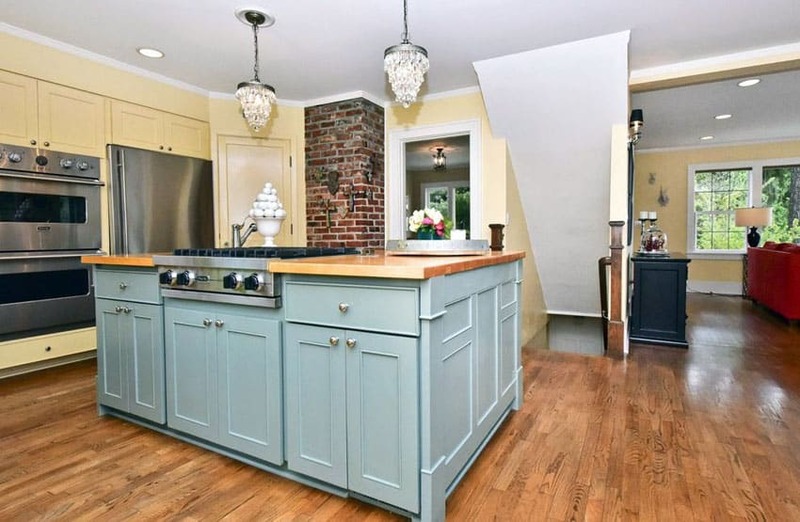 You will also notice that while it still uses an apron-front kitchen sink typical of the style, the sink used was in stainless steel for a more modern look. Teak wood floors serves as the base for this cottage kitchen which uses a black & white color scheme throughout the design. 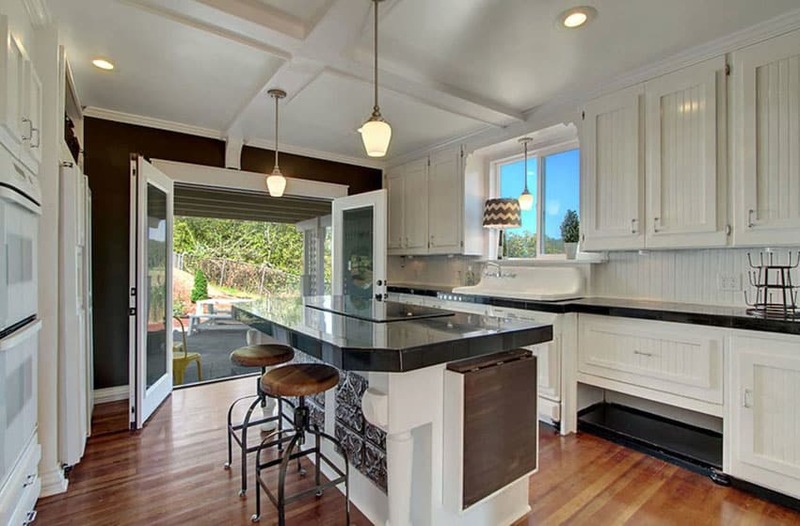 Beadboard kitchen cabinets are all painted in white and is combined with black granite for the countertop. Black was the color for choice for the accent wall, and while very bold, the white ceiling and doors help dampen it a little and create a more balanced appeal. Cherry wood floors set a very bold background to this kitchen space, adding warmth and a classic elegant appeal. The kitchen cabinets are all paneled and painted with a very light sage green color which gives a nice cool contrast with the bold red tones of the flooring. You will also see Spanish style details in this design, such as the turned legs used on the large kitchen island, as well as other common Spanish style motifs. 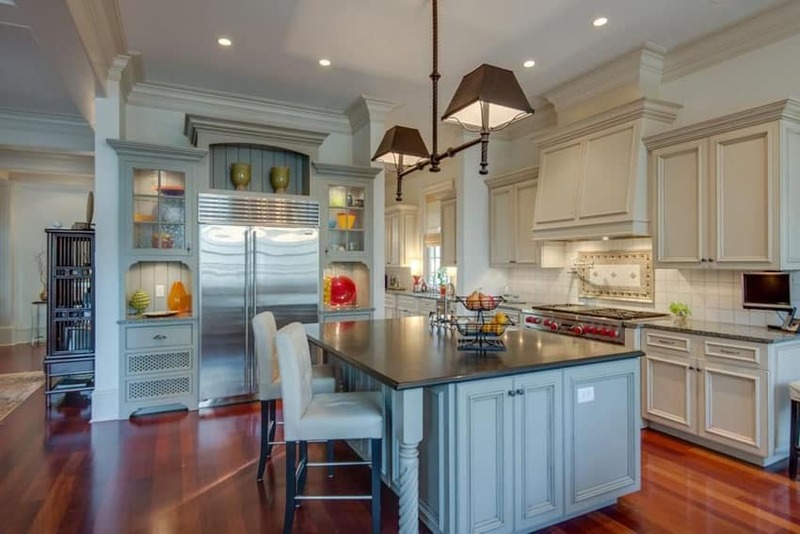 French style doors for the overhead cabinets is very common in classic style kitchens, but this design uses latticed overhead cabinet doors instead, for a more unique look. Cabinets were painted in a pink-undertoned white color and placed against an orange-brown wall color. The kitchen also has a unique L-shaped island counter with a built-in small dining area to effectively combine the kitchen and the dining space whiles still offering privacy between the two spaces. 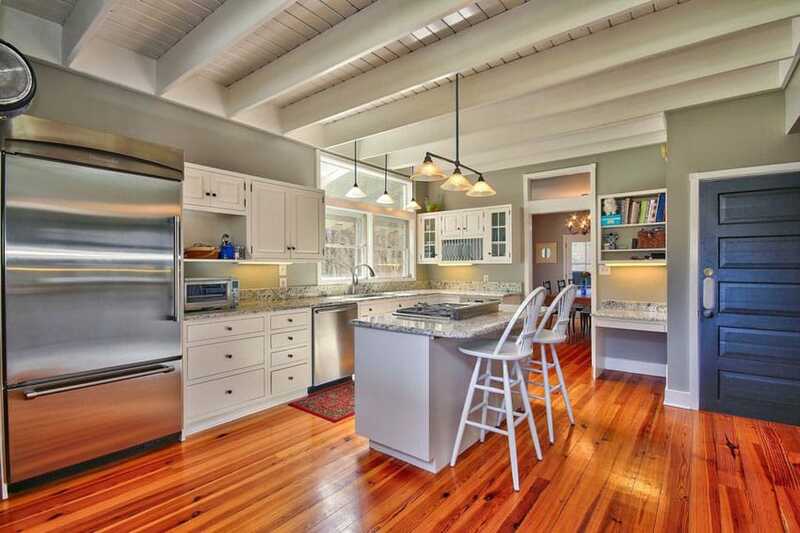 Cherry wood floors and gray walls serve as the background for and modern cottage style kitchen. Main kitchen counter base were painted in white while the kitchen island base kn a darker wengue color. It uses cup pulls for its drawers to give the cabinets a more classic look, yet still match the brushed stainless steel finish of the kitchen appliances. Using modular cabinetry with cottage style profiles, this kitchen achieves a classic look with a modern simplicity. Washed oak flooring set a rustic background to the space and helps the white kitchen cabinets stand out against it. The kitchen island, on the other hand opted to blend in more with the flooring color, painting its base with a matter washed brown color and using light beige stone countertop. With bold orange undertones present on the flooring, the kitchen cabinets opted for a more subtle look. White was the color of choice for the cabinets, paired with a very basic salt & pepper granite countertop. It adds a couple of open overhead shelves as well for a more cottage-style feel. Many cottage kitchen ideas use subtle color themes such as one color for the base cabinets and another for the island to achieve the desired feel. This cottage-style kitchen has a very country home feel with its combination of rustic colors and finishes. With a dark oak flooring, the kitchen opted for off-white paint for the cabinets to make it stand-out. Main cabinets has molding details to give it that classic feel, while the gray stone tiles used for the backsplash adds a nice rough texture to the surface. The large kitchen island has a beadboard front on the base, with turned wood supports for the salt & pepper granite overhang. 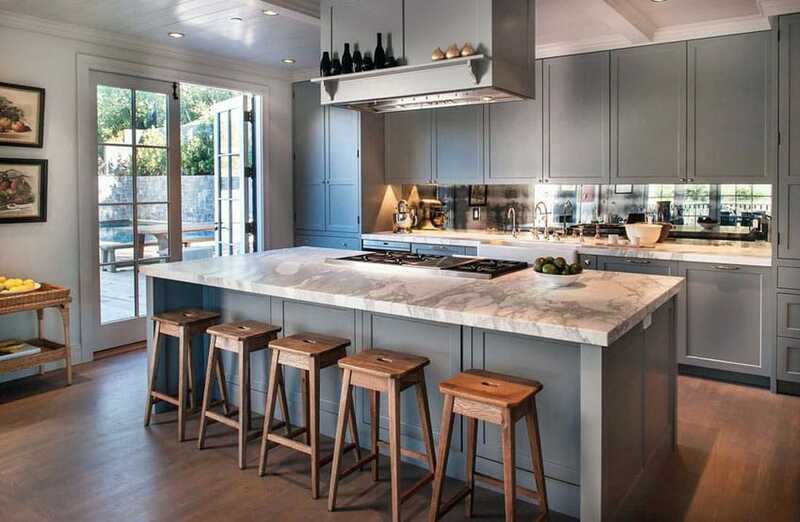 The metal bar stools used on the other hand, gives a very subtle modern touch to the space. This large kitchen space definitely keeps a consistent traditional style throughout, from cabinets, to finishes and accessories. Teak wood floors sets a cozy mood for the space, while the off-white paint used on the paneled cabinets helps give an “aged” feel to the cabinetry. The main counters uses black granite, helping separate the color of the cabinet from the white subway backplash tiles. At the center of the kitchen is a long rectangular kitchen island which has a gray-painted base cabinet and white marble countertop, helping add more variety of finishes to the space. It uses Chippendale barstools in dark wengue and an antique ceiling lamp to match with the while look. This small modern kitchen uses modular cabinets, but applies the aesthetics and finishes of cottage style kitchens. Painted cabinets with moldings paired with dark wood flooring. For this example, ceramic floor tiles in wood finish was used instead of real hard wood flooring, making it more resistant to moisture exposure. The cabinets are uniformly painted in a light gray color and uses solid wood countertop. A simple classic style cottage kitchen design which stylizes traditional style cabinets and applies it on modern modular pieces. Oatmeal walls and teak wood flooring sets a warm ambiance, and the white neo-classic style cabinets stands out well against the strong orange undertone of the wood flooring. Using gray-beige toned slate for the countertop, the main counter maintains a simple and elegant feel. 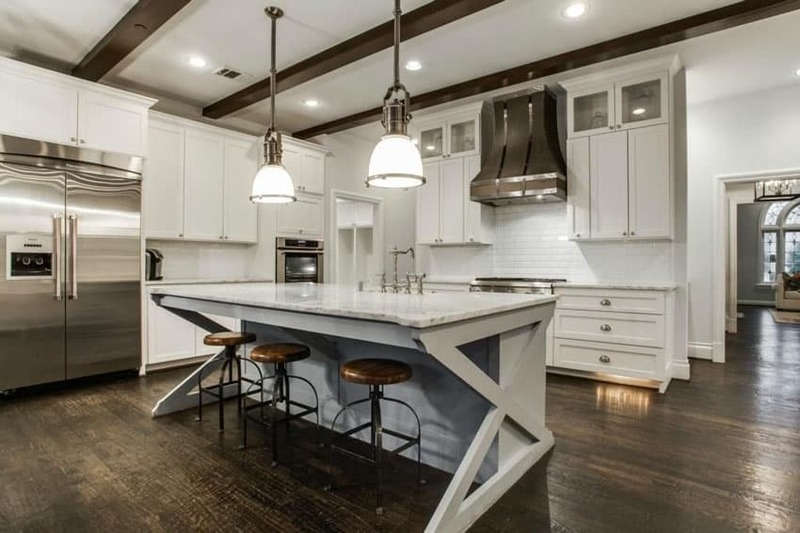 There’s also a large kitchen island in the middle which has a more cottage style feel as it uses beadboard cabinets with turned accents on the corners. The base of the kitchen island was painted with a soft powder blue color and topped with solid teak wood countertop, adding a nice touch of cool tone to the space. 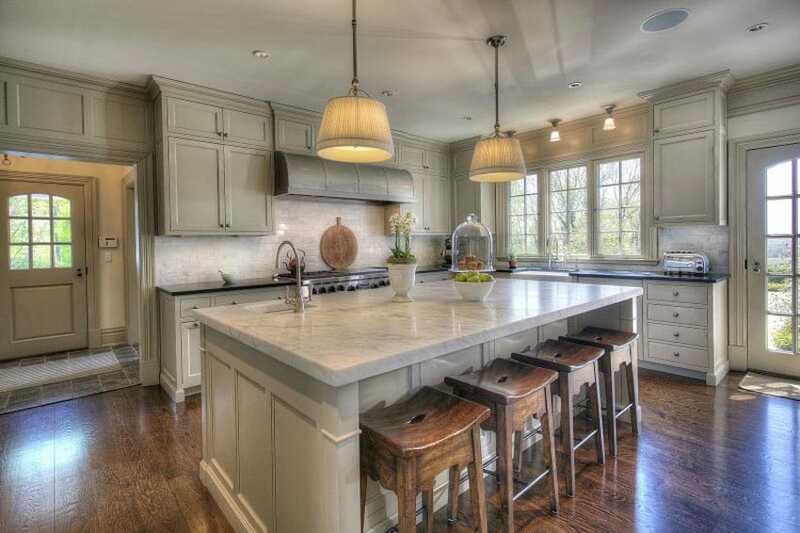 This beautiful cottage kitchen offers plenty of seating from its large island with gray/green cabinetry topped with white calacatta marble. Rich brown wide plank wood floors are an attractive contrast to the white details of the molding and ceiling design and countertops. Cottage kitchen ideas that use vintage decor such as the round adjustable bar stools, or pull handle hardware can subtly bring elements of the style in to the design. The rough texture of the weathered oak wood floors set a nice rustic base for this kitchen space and allows the plain white cabinets to stand out. 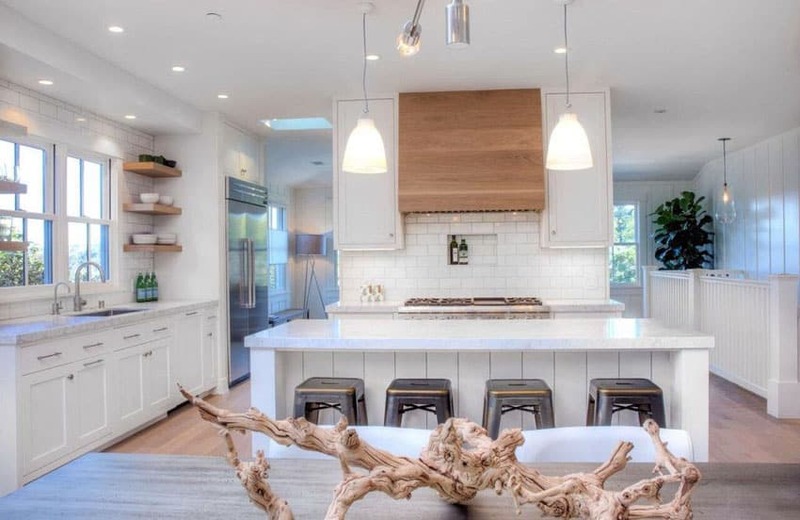 For this kitchen, the cabinets used are all painted in white, with matching white Carrara marble countertop and white subway backsplash tiles. It applies neo-classic style moldings, and stainless steel shell drawer pulls to pull-off a vintage look.